API device on BREAKAWAY vest (For UPS). 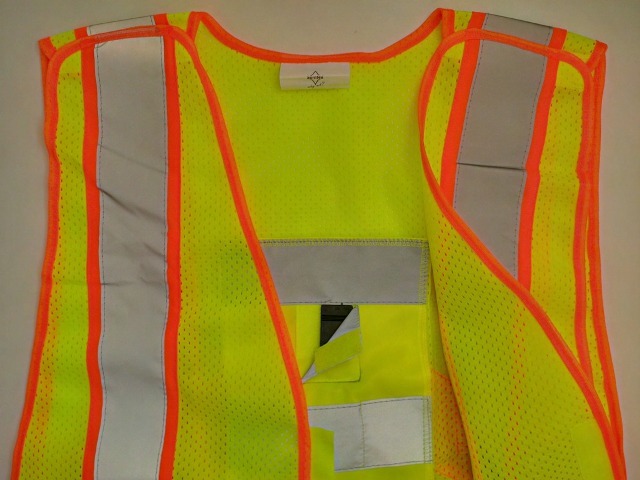 Velcros on shoulders and on the sides of vest to prevent accident with mechanism movement around. Use: When the bearer of the API adopts a potentially dangerous posture (angle &gt; 45 °), it is instantly called to order by the alarm. This alarm-induced reflex a rectification of the posture of the warehouseman. For more information, I invite you also to visit the site to watch the first video demo (think set the volume loud enough) the API was adopted in sectors of activity varied, ranging from logistics to production of cars passing through public service and training centres, not to mention the BTP temporary work companies, etc... the API is used by the bodies of trades where handlers perform manual handling residual, but his side educational and playful, and the fact that it is adapted to a jacket high visibility represents a real added value for companies in search of innovation health prevention. Simply wear the API periodically by campaigns of 3 or 4 days to curb long-term poor posture. Certain activities do not permit the wearing of jacket high visibility, this is not a problem: the API can be integrated to any garment. Indeed, at the request of some customers we implement the Velcro fastening inside jackets. API alarm its user by a non-aggressive sound when it looks its bust forward until it forms an angle of 60 ° (+/-10 °) about with his legs. Thus, throughout the handling operations, API will be able to remember to bend the legs to preserve back. What: The manufacturer certifies the conformity of the product with the essential requirements. Precautions for use: do not immerse the whole. Cut the circuit thanks to the switch after each use to ensure optimal durability of the battery. Warning: Never attempt to recharge the battery, disassemble or short-circuit the. Never touch with an iron soldering or expose it to heat. Do not dump the fire or water. If the battery liquid accidentally enters your eyes, do not rub them. Rinse with water and consult a doctor immediately. Misuse of the battery may cause a leak. The battery liquid is corrosive and can damage the contaminated surfaces and creates a risk of fire or personal injury. Please observe the detailed on these operating instructions for your safety. IMPORTANT: The device has not been tested to operate in environments ATEX.